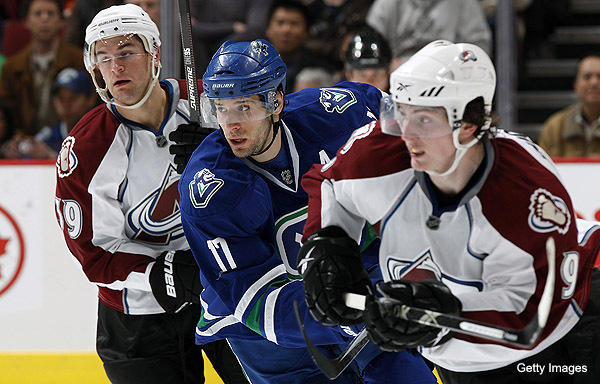 As the Colorado Avalanche close out their 3-game road trip against the Vancouver Canucks in Vancouver, the Canucks will play game 2 of their 5-game home stand. This is the first of three meetings between the two teams. With 3 consecutive wins, the Canucks have gained some ground in the Western Conference standings. They beat the Phoenix Coyotes on Friday to tie them with the 8th most points in the conference (though the Coyotes do have 2 games in hand), and are just 2 points back of the Minnesota Wild, the other team on top of the Canucks for a wild card playoff spot. Meanwhile, the Avalanche have cooled off slightly after their torrid 14-2-0 start. They’re 1-1-1 in their last 3 games, and 6-5-0 in their last 11. Daniel Sedin notched another 2 assists against the Coyotes, and he now has 6 points (2 goals and 4 assists) in his last 5 games, and 11 points (3 goals and 8 assists) in his last 8 games. Jason Garrison also scored the Canucks’ first goal on Friday night, and he now has 7 points (2 goals and 5 assists) in his last 5 games, and 9 points (2 goals and 7 assists) in his last 7 games since breaking out of his 14-game pointless streak. For the Avalanche, their captain, Gabriel Landeskog, is on a 4-game point streak. He has 6 points (2 goals and 4 assists) in that span. The Canucks will be playing without Alex Burrows, Alex Edler and Jordan Schroeder. Let’s hope no one else gets added to this list. The Avalanche will be playing without defenseman Jan Hejda, who is out for 10-14 days with a knee strain, defenseman Ryan Wilson, and forward Alex Tanguay.